Let the culinary capers commence. Is there a better alternative to BurgerTime Deluxe? Is BurgerTime Deluxe really the best app in Arcade category? Will BurgerTime Deluxe work good on macOS 10.13.4? BurgerTime Deluxe needs a rating. Be the first to rate this app and get the discussion started! BurgerTime Deluxe... Let the culinary capers commence as Namco proudly serves up BurgerTime Deluxe for Mac! Enjoy a full course in the extensive Story Mode, or just sit down for a light snack in Quick Mode. Join Chefs Peter Pepper and Sally Salt as they help their uncle thwart the dastardly Vinnie Vinegar. 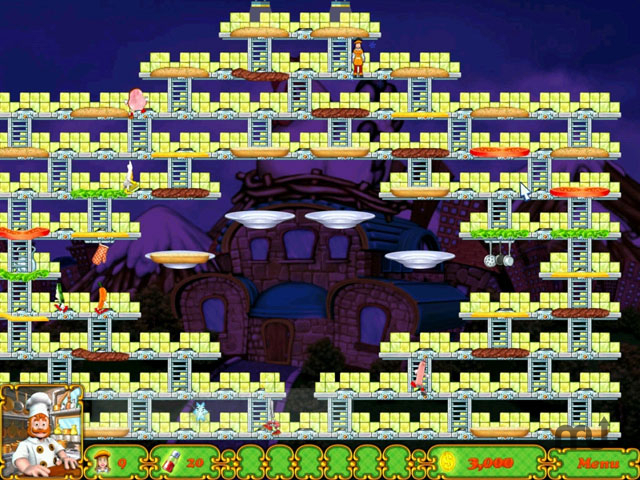 Scale the platforms and assemble the burgers to clear the levels, then speed through the exciting minigames. Avoid Vinnie's henchmen, Mr. Hotdog, Mr. Egg, and the other baddies as they look to make short order of you! Daze baddies with your handy pepper shaker and use special items to freeze, cook, or salt them to your tastes. Earn big points by squishing your edible adversaries with falling ingredients or dropping a piece out from under them! Who says you shouldn't play with your food?